These notes on the Carolina Transition Offense came from Creighton Burns’ newsletter who found it on the Xs and Os of basketball. – Always outlet ball side because its faster. – Players should catch the ball on the run and run their lanes as wide as possible. 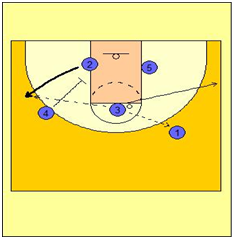 – Reverse the ball, get it going side-to-side as much as possible. 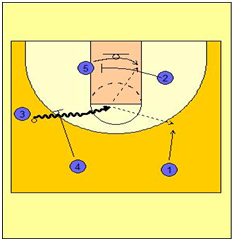 – Bigs should run rim to rim with the trailing big looking to hit the other big on the run or on early post-up. – If there are 2 or less defenders, try to score in 2 or less passes. Run the secondary break if more than 2 defenders. They start the offense in the most vanilla of ways. Ty Lawson dribbles up one side of the floor. The ball is reversed to the opposite site and Hansbrough who attempts to seal his defender to shoot his little turn and shoot 2-footer off the glass. 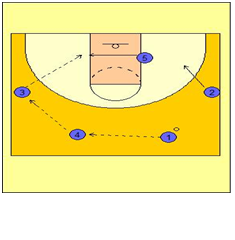 If they are unable to get the ball into Hansbrough because of a fronting defense or so, O4 comes to set a ball screen for O3 on the wing (O4 usually isn’t so high after the ball reversal). O2 sets a cross screen for O5 who goes under the screen while O3 comes off the ball screen shoulder to hip. If O3 can shoot the 3-pointer, he does so. Otherwise, O3 should drive into the middle of the floor, Hansbrough should be right underneath the basket if X5 goes to help on penetration. O1 has shuffled to a spot on the top of the key, this is also where a lot of 3-pointers happen as the defense collapses on the penetration. Finally, if O3 is unable to do any of the above, they go with a screen the screener action with O4 setting a down screen for O2 coming up to the wing. O3 can hit O2 for the 3-pointer (usually Ellington). O3 cuts opposite wing-corner. If all else fails, O3 passes back to O1 and then UNC runs their true motion offense. The UNC secondary break is exceptionally simple, yet when executed properly, it is very hard to stop as we’ve seen the past several years with UNC. Getting the ball into the post early on, and shooting well from the perimeter are obviously crucial.